How do I earn and redeem points at other Nexus Mobile merchants other than Keells? 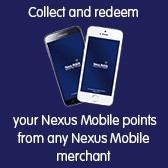 Can I continue to earn points using my old Nexus Card at Keells and other merchants? Can I use any mobile number (from any operator) to register with Nexus Mobile? What if I want to change my mobile number which is registered with Nexus Mobile? Simply inform our call center on 0777 733 833 or 0112 303 500 and request for a re-registration. What is the value of a Nexus Mobile point? 1 point = 1 Rupee. How long is my Nexus Mobile registration valid for? What do I do if I lose my Nexus Mobile card? Don’t worry, you do not need the card to earn, redeem or qualify for an offer from any merchant you can use the Token Card instead. Please call out hotline and inform us about the lost card in order to purchase a new one. Nexus Mobile is built around our valued members and their feedback. Please do not hesitate to contact us for any clarifications or should you have any suggestion regarding our operations feel free to keep us posted.